An uproar in Fort McMurray, Alta., over a viral video that some considered racist has led to a minor hockey team forfeiting the remainder of its season because of safety concerns. Team parents say the players have faced death threats and humiliation. 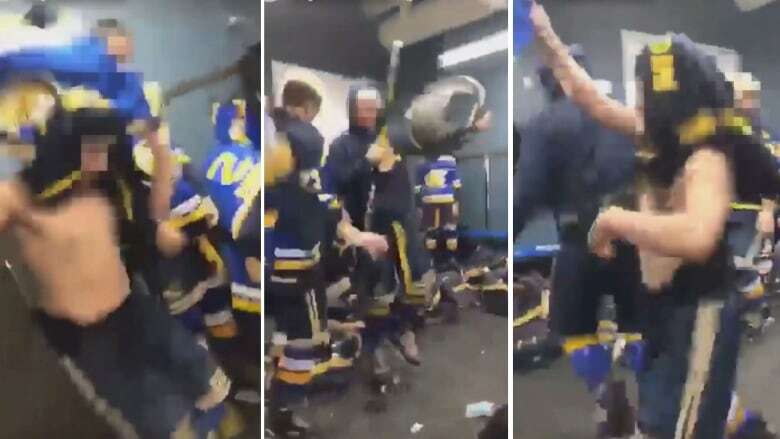 A video posted to social media showed players on the Fort McMurray Midget 'A' Junior Oil Barons dancing and drumming along to music in the team's locker room. An uproar in Fort McMurray, Alta., over a viral video that some considered racist has led to a minor hockey team forfeiting the remainder of its season because of safety concerns. Parents of players on the Fort McMurray Midget 'A' Junior Oil Barons issued a statement this week strongly criticizing the "brash actions" of the Fort McMurray Minor Hockey Association after an online video surfaced last month showing young hockey players dancing to the song Electric Pow Wow Drum by A Tribe Called Red. "The video showed a few team members, some of them Indigenous, engaging in a motivational dance," the parents said in their statement, issued Wednesday. "This was not intended as a derogatory or racist act." The parents said they are telling their side of the story after "failed attempts" to come to a resolution with the minor hockey association. On Jan. 21, hours after the video surfaced online, the association issued a media release saying it was "devastated" by the players' actions in their "disrespectful" video. "It is wrong and will not be tolerated. The display of ignorance is sad and gravely unfortunate," association president Travis Galenzoski said in the statement. "These players will know how deeply impactful their wrong actions are." The statement no longer appears on the association's website or social media feeds. In their own statement, the parents said the hockey association's actions "contributed to team members receiving death threats, threats of harm, and humiliating and degrading comments about them on social media." At least one team member had a "police presence" after the hockey association's statement, "in direct response to threats made against them." The parents said the hockey association failed to consult with anyone from the team before publicly condemning the video and the players' actions. "FMMHA's media statement was released within three hours of the video surfacing," the parents said. "This action, coupled with the failure to contact any staff member on the video about the video, demonstrated a lack of thorough investigation to the facts of the video and breached the fiduciary duty it owes to its players in looking after their safety and best interests." The hockey association identified the team name, allowing people to "identify, locate and publish personal information about the players on the team, as well as their upcoming schedule for the remainder of the season," the parents said. Shane Kearney, the father of a player not in the video, told CBC News the video was meant "as a way to pump the boys up before the game. "We felt like they [the association] owed the boys a public apology." Roxanne James, a parent whose son was also not in the video, said players had to deal with threats and criticism. "They were ridiculed," she said. "They were humiliated." CBC has sought comment from the association but has not heard back. The video shows players, some in skates and Junior Oil Barons hockey uniforms, dancing to the tune. One player uses the lid of a garbage can as a drum, striking it with a hockey stick. Some laughter is heard in the background. CBC has chosen not to publish the full video because the players range between the ages of 15 to 18. In another statement on Jan. 23, a lawyer for the McKay Métis Association said two boys in the video are Indigenous. Dwayne Roth said the boys were pow-wow dancing in the locker room before the game and the dance was intended to reflect their culture and motivate the team. "Rush to judgment based on out of context video clips is becoming all too common and poses real danger to the reputation and safety of those incorrectly labelled." In their statement, the parents said they decided to forfeit the remainder of the season because it was "too dangerous" for the players, their families and others involved. The team forfeited a total of six games, including two scheduled for this weekend. The team has paid a $2,100 penalty for dropping out but has decided to take part in provincial play-downs "in hopes to end the season on a positive note." The parents slammed the hockey association for ignoring "one of the basic tenets of today's inclusive and tolerant societal norms, namely, not understanding the other side and rushing to a rash, often incorrect, judgment."